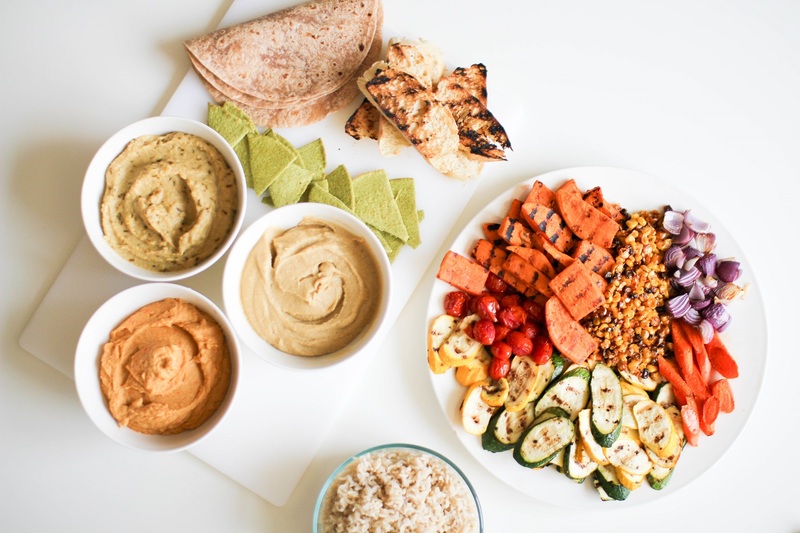 This grilled veggies and hummus trio is perfect for grilling season! Especially with 4th of July right around the corner! USA, USA, USA! I have no words! I have no good words to explain to you how delicious this is! There are so many wonderful flavors. 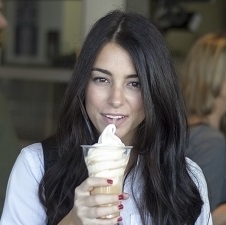 The only small problem was that there was not enough space in my mouth to shovel it in as fast as I really wanted to. Also, I had trouble putting it away because I kept wanting one more bite. Struggles! 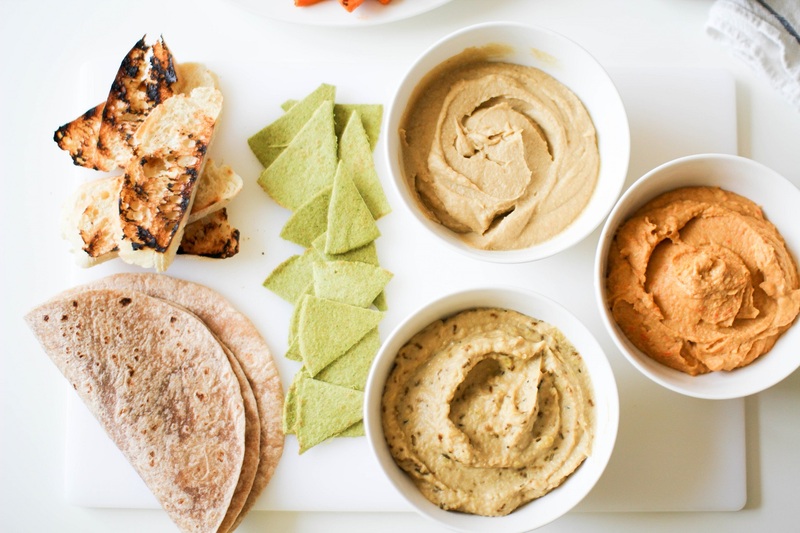 This veggie platter and hummus trio is good any day of the week but wouldn’t you especially love to bring this hummus trio to a cook out and watch everyone devour them? Or maybe you’re having a cook out. 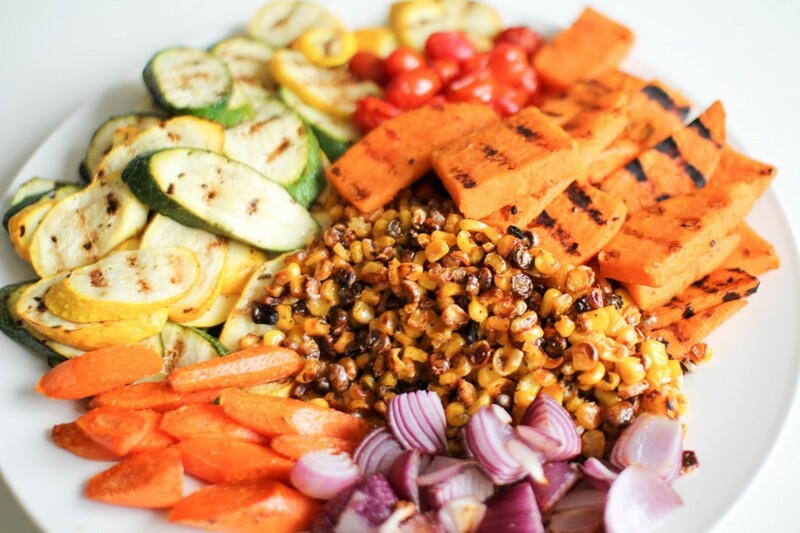 Grilled/roasted veggie platters are impressive, are they not? They are so colorful and the beautiful char marks scream flavor. 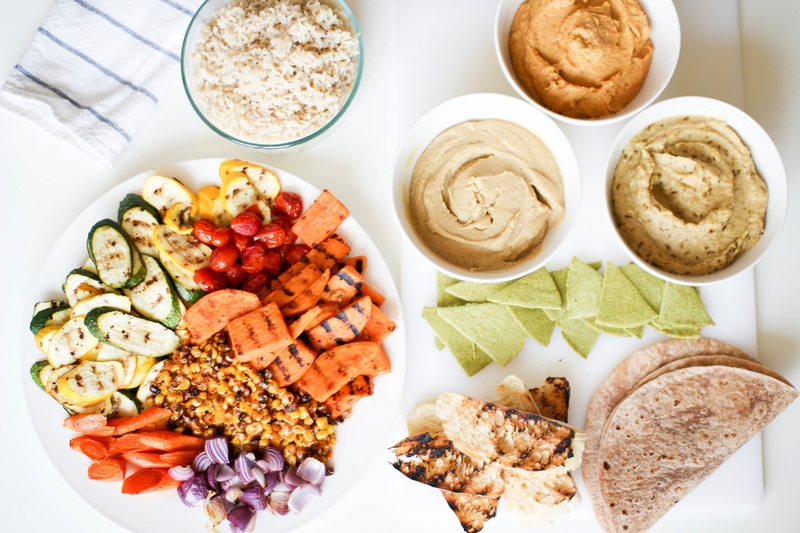 Even if you’re not up for roasting and grilling your veggies you could still serve the hummus trio with some assorted breads and veggies. I love having hummus and veggies. See here. Or here. Now before you scroll down to the recipe section and see all of the recipes, let me tell you it looks like a lot of work! But that is just because there are detailed veg prep instructions. Easy-peasy. Also you are going to be able to multi-task! You’re going to prepare all your garbonzo beans at once. You’re going to be roasting things together, not individually. You could also make the hummus the day before. You could pre-cut your vegetables. Whatever works for you to make you more efficient. 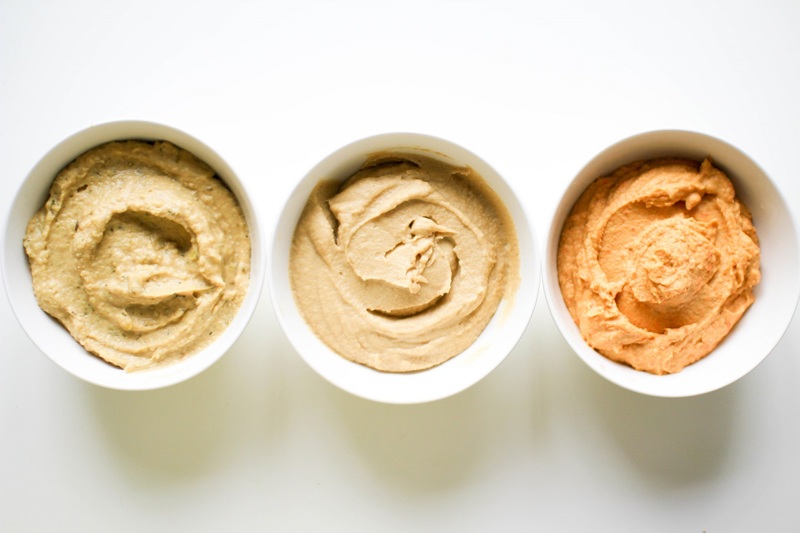 I’ve made hummus so many times I wouldn’t even be able to guesstimate how many times. I always used the beans straight from the can into the food processor. I’ve added another step that I think was worth it. I decided to cook them with baking soda first after reading this: Yotam Ottolenghi and Sami Tamimi’s method. I’m not saying I used their method exactly because I didn’t really read all of it. I skimmed through and decided to cook the beans in baking soda. 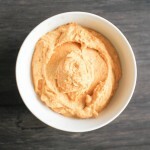 I plan to keep making my hummus with the baking soda method. I’ve explained how I did it in the recipe section. They are much softer therefore blend smoother. This is what the beans look like once they’ve been cooked. 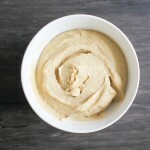 I didn’t have any tahini on hand, and really wanted to use it in my recipes so I made some. I had sesame seeds in my spice pantry so I winged it and it turned out really great. I included a recipe below. 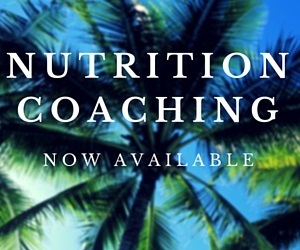 I suggest buying it if you can though- it’s much less work. That’s the tahini next to the roasted carrots. Tips: Be very light handed with your oil. It goes in many of the components that make this meal, which means the calories can sky rocket if you aren’t careful. Only add a tiny bit if you feel you really need it. Also be very light handed with salt since it’s also going in many of the components as well. Final tip, save the water you cook the beans in for adding to the hummus if it needs to be thinned out. 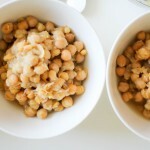 How to prepare garbonzo beans to use in hummus. Drain beans and put them in a stock pot. Sprinkle over the baking soda and cook as if sautéing for about 5-8 minutes. Once there seems to be no moisture left add enough water to just cover the beans. Cook until the beans are very soft and outer casings are falling off. This may take a while, but it’s worth it. Prepare roasted garlic by peeling off the outer paper, cut the top of the garlic off making sure you expose the garlic. Set head of garlic in foil, drizzle a tiny amount of olive oil and lightly salt the top, close up the foil. Bake the garlic for 40 minutes then remove from the oven. It will slide right out of its peel. 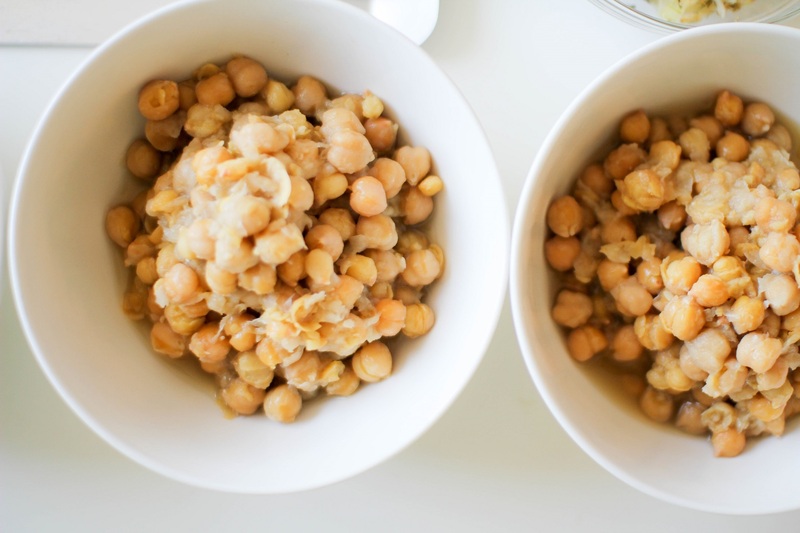 You may need to add some cooking water to help smooth out the hummus. Cook onions until soft or brown depending on your preference. As long as you use a non-stick pan you shouldn’t need any oil, or very little. Half way through cooking add your rosemary. I used dry rosemary because I did not have fresh, but fresh would be best. A little goes a long way, you need very little. Peel carrots and cut off tips. Slice in half lengthwise. Lightly spray the tops of carrots with cooking spray. 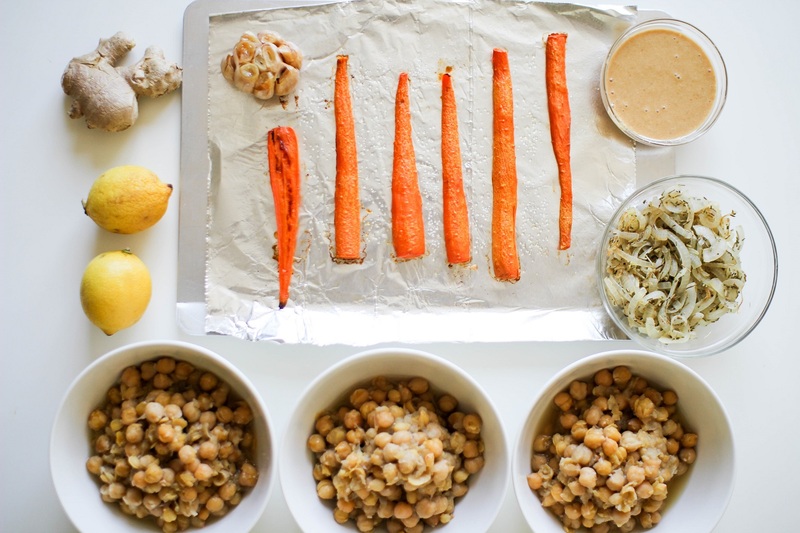 Lightly salt the carrots and place in the oven for 30-40 minutes or until roasted and soft. 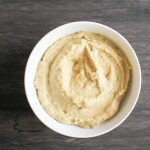 You may need to add some cooking water or more lemon juice to help smooth out the hummus. 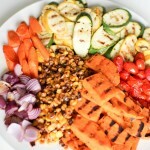 Delicious grilled and roasted vegetable platter. Start by peeling, slicing, and boiling your sweet potatoes until tender. Once softened drain and rinse with cold water to stop the cooking process. Lightly coat with 1 tsp olive oil, smoked paprika (love the smoky flavor), garlic powder, and salt. Lay sweet potato pieces on a grill pan. Flip and remove when grill marks are present on each side. The tomatoes, carrots, corn, and onion are going to be roasted. Place tomatoes in a casserole dish or Pyrex, lightly sprinkle with salt and 1 tsp of olive oil. Toss to coat and place in oven for 30-40 minutes. Carrots and onions can be cooked together on same foil lined pan lightly sprayed with cooking spray. Peel and trim carrots, cut at a diagonal. Cut onions in half, then in half again. Remove outer layer of onion, trim off ends, cut in half again. 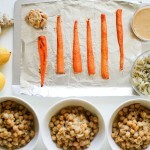 Lightly sprinkle carrots and onion with salt and lightly spray tops with cooking spray. Roast them in oven for 20-30 minutes. Spread frozen corn on a lightly sprayed baking sheet and lightly sprinkle with salt and pepper. Bake the corn for 10-15 minutes or until crispy. Wash and cut zucchini at a diagonal. Toss them in a bowl with 1 TBS olive oil, 1 TBS of apple cider vinegar, salt, pepper, and oregano. Lay zucchini on a hot grill pan, flip and remove when grill marks are present. 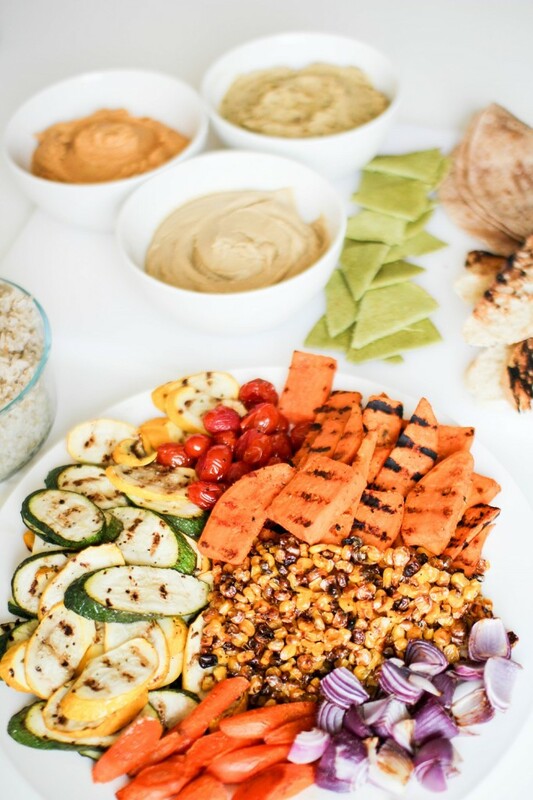 Serve veggies on a big platter family style, with hummus trio, brown rice, and some bread options.